Rosguill is a peninsula in north Donegal pointing out into the Atlantic Ocean, to the west of the well known Inishowen and Fanad Peninsulas. It is on the Wild Atlantic Way and has scenery to rival anywhere in Ireland. 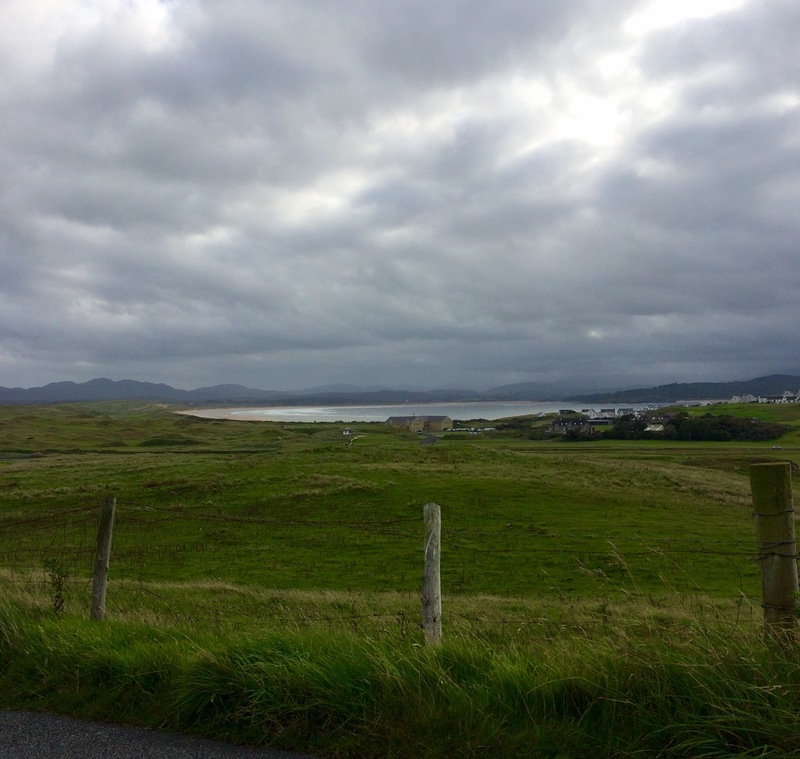 It is also in my home parish of Mevagh and any trip home is not complete without a jaunt along the Atlantic Drive. Our village of Carrigart lies at the entrance to the peninsula and it was from here that I headed out last week and I hope you enjoy these few snaps from my phone. Carrigart village is on the shores of the sheltered Mulroy Bay overlooked by Gainne a high hill across the shore. The Carrigart restaurant is under new management and offers a very interesting menu for travellers and a very comforting log fire! Leaving the village of Carrigart we head towards the neighbouring village of Downings crossing the area known locally as the Lee. Years ago horse racing was held here and it was a great venue for young boys playing soccer. This stone bridge, Ballyhogan Bridge, used to be an iron bridge and we children were subjected to awful warnings from adults about the particular part of a stream that flowed under it, known as ‘The Black Hole’. The Atlantic Drive Road. This is a loop, but I like to drive it in the other direction via Downings. Downings, on Sheephaven Bay, has a couple of hotels and a number of restaurants. as well as the famous McNutts weavers. Once it was a very busy herring fishing port. Its maritime history is acknowledged near the pier with a memorial to locals who drowned in the area, including the three little McCorkell children who drowned in 1921 when herding geese and they were cut off by the tide. The inscription belies the fact that their little bodies were not all recovered immediately. Their father William recovered 5 year old Elizabeth at Aughadahor on March 22nd; 7 year old Jane was found by Edward Shiels on Downings Beach on March 29th and Willie aged 3, was found washed up on Downings Beach by Cornelius Boyce on April 7th. What a terrible tragedy for the family who lived in Aughadahor, which is on the upper end of nearby Tramore Beach. Also at Downings Pier is a gun from the SS Laurentic, an armed merchant cruiser that sank after hitting two mines off Fanad Head on January 25, 1917 with the loss of 354 lives. The gun was salvaged by the Downings Diving group. These memorials are my first stopping-off point as I like to remember that the sea in all its majesty, also claims lives. Heading on, there is some spectacular scenery to the left out over Sheephaven Bay, looking towards the Ards Peninsula and Marble Hill strand with Muckish in the background. Sheephaven Bay lies between the Rosguill Peninsula and Horn Head. Stopping places are limited but there are some viewing points along the way. At Dooey, the little beach slopes dramatically and depending on the weather and tides it may be accessible, but is not safe for swimming. A few hundred metres further along there is a magnificent viewing point with views of Horn Head, back towards Dooey, and Tory Island, just about visible to the right of Horn Head, and the wild Atlantic Ocean. The Atlantic Ocean meets land. This is an Irish speaking area, known as a Gaeltacht. In spite of the strong wind blowing on the day of my visit, the sea looked relatively calm. a large swell was expected the following day. A short distance away is probably one of the most spectacular views in Ireland. The famous postcard pair of beaches at Tranarossan. The next photo of Tranarossan was taken last year on a very misty day when the sea was very calm. Tranarossan has so many moods..it is different at every visit! Just above Tranarossan Bay it is possible to see some hard won little fields, in all probability fertilized with sea weed to turn the rough scrub into lush green fields. I often think that I would not mind living in this sheltered little valley with this spectacular backdrop! Driving up the hill, a breathtaking view opens out ahead. This is the entrance to Mulroy Bay, where the Atlantic rushes in between the Rosguill and Fanad Peninsulas. The ancient graveyard and church ruins of Mevagh, from which the parish takes its name, are located here at the water’s edge. Here too is an ancient early christian cross. On a clearer very calm day some years ago I was able to take these pictures. At the end of the Atlantic Drive, Tramore beach comes into view again. The Atlantic Drive, only a few miles long, is to my mind, one of the most spectacular routes anywhere in Ireland. There are two professional landscape photographers in the area, if you would like to see stunning images from this beautiful part of Donegal and across the county, click on the links below!